Rep. Lee, an African-American woman, is one of many Democratic women who have spoken out against this bill. Their reasons are quite sound. The American Congress of Obstetricians and Gynecologists do not support the bill "because it would require medical professionals to “violate doctor-patient confidentiality." But according to Fox Nation, they're supporting "genderside." The semantic word game here is truly amazing. Using Fox Nation's "logic," any opposition to anti-choice legislation is supporting some kind of murder. The linked article on "Real Clear Politics" has video and the transcript of Rep. Lee stating that "the next act will be dragging women out of patient rooms into the streets and screaming over their bodies as they get dragged out of getting access to women's health care. That's what I feel like is occurring today with the legislation that is on the floor." And that's it. The title of the piece is "Jackson Lee On Abortion Bill: Next Act Will Be Dragging Women Into Streets." No mention of "genderside." Yet, Fox Nation accuses a member of the US House of Representatives of defending murder. It's obvious that the headline writers at Fox Nation loathe women who speak out for reproductive rights. And these are the same folks who say there's no war on women. But why did the single out Sheila Jackson Lee? Oh right, she's a pro-choice, African-American women and, as such, not welcome in Fox Nation. 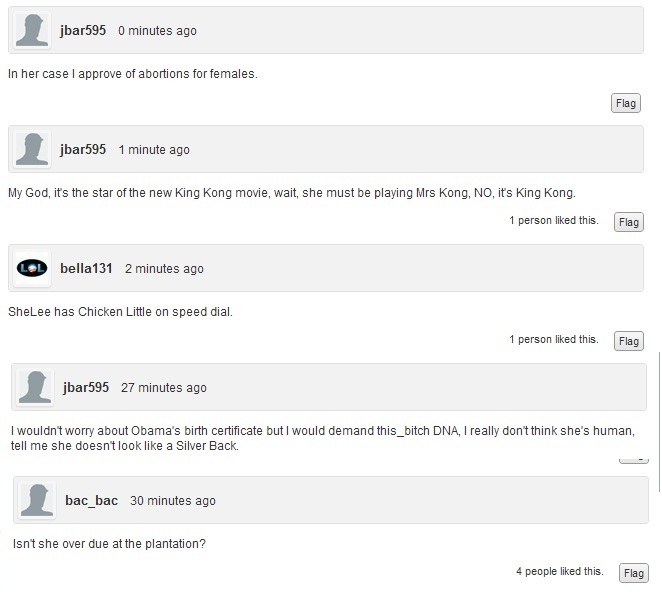 And true to form, the comments are full of the racism that the "real" Americans at Fox Nation are so proud of. One little problem with the above article. It’s Gendercide not genderside. With people like Killer O’Reilly and Kkklannity on the Fux Nuze payroll the Hate, Racism and Death Threats grow like weeds. Seriously, I’m not even asking this as a joke anymore… can Fox Nation be officially deemed a hate group now? I know that as liberal/progressives ‘hatred’ is not really part of our culture, but these morons do tempt a man! Let me just say that the world will NOT miss their intellect when the finally, mercifully get raptured.